if you take the overground railway to highbury islington, walk down upper street, then turn off onto cross street, turning left at the junction with essex road and walking a few hundred metres east, you'll come to mosquito bikes. at least, if you've just come from kentish town that's what you'd do - while this may sound as if i have even the remotest idea of which i speak, there will doubtless be londoners reading and laughing out loud at the naivety of my rudimental london geography. anyway, that's the way i did it, and it got me there in one piece and pretty close to my ever-changing timetable. mosquito bikes entered the world as a small repair shop in dalston twenty-five years ago, moving to its current location in essex road five years later. it's co-owned by phil, gill and roger with six employees in the shapes of dobbin, sam, dougal, mac, bertie and joe. all are regular cyclists (would you expect anything less?) but with phil the only one left racing. also racing under mosquito colours, recently during the cyclocross season and also for the forthcoming road season, is the guardian's former two wheels columnist, matt seaton. in the manner of all the very best bicycle shops, mosquito bikes is rather unassuming in its presence; two display windows with the door in the middle. the window display at the time of visiting featured plantlocks manufactured by the frontyard company. these consist of oblong metal bins with solid handles on the top. 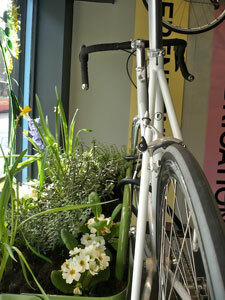 by filling a plantlock with (surprisingly enough) plants, a bicycle can be u-locked to either of the handles, providing an attractive and secure alternative to a set of railings. frontyard have a lengthy connection to mosquito, having designed the interior of the shop as it is now. it's a busy shop, both in content and customer service. mosquito also provide a fitting service, so the area between the 'till' and the workshop features one of those infinitely adjustable bike thingies (serotta bike-fit) in front of a white screen overlooked by a digital camera on a tripod. bearing in mind the exclusive nature of mosquito's profferings in the frame department, it does seem like rather a good idea to make sure the expense (standard fitting service is £120 - $240) is justified by having your choice fit properly. 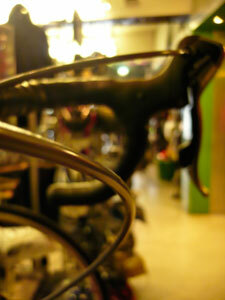 mosquito intend soon to offer the retul measuring system as an adjunct to the serotta. a simple list of the marques available from mosquito is enough to make the average cycle fan drool over the handlebars. choose from moots, independent fabrication, pegoretti, colnago, litespeed, merlin, fixie inc. and just announced since the north american handbuilt show, crumpton carbon fibre frames. the latter, just like pegoretti and fixie, is exclusive to mosquito. their claim to component fame is being one of only two phil wood dealers in the uk, the only one in the south of england. a quick look into the mosquito workshop at the back of the premises saw a moots mountain bike on a workstand, with other repairs and build-ups relaxing in front of a considerable selection in orderly rows, of bicycle tools. co-owner and shop manager, phil burnett said that, despite the expensive offerings in the front of the shop, the mechanics are happy to repair pretty much anything, though you might find that repairs to one of those supermarket jobbies cost more than the bicycle itself. a deluxe service, the sort of thing you really should have every year if you ride as hard and as often as we all do (don't we?) will cost £100 - and if you really can't do without two wheels while mosquito's mechanics lavish care and attention on your pride and joy, there's a free loan bike available with the deluxe or standard service (standard costs half the deluxe). 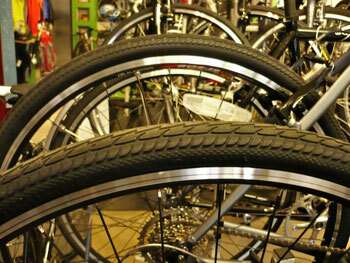 however, you might want to learn how to mend your own punctures - charge is £14.50. naturally enough, if you've just acquired the bike of your dreams from mosquito, it might not be a bad idea to kit yourself out with some appropriate clothing - jeans and a t-shirt don't quite complete the image on a custom painted pegoretti. 'real' cyclists can choose from etxeondo, altura and demarchi, while those of a more rustic nature can kit themselves out less ostentatiously from the range of swrve apparel to suit the commuting/city cyclist. and just recently announced, in common with mellow johnny's in austin, texas, mosquito will soon be stocking new zealand's solo clothing, quality cycling apparel often featured on the post. 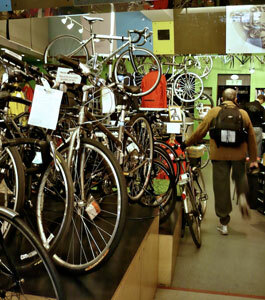 there are a lot of very good bicycle shops in london; mosquito bikes are undoubtedly among the upper echelon of those. if you live within striking distance, it's a great bike shop in which to 'hang out' if such activity is still de riguer these days. if, like thewashingmachinepost, you're only in town for a day or two, keep the address near the top of the list. that and a well heeled credit card. mosquito bikes live at 123 essex road, islington, london. thanks to phil for selfless hospitality during the country boy's visit.